"So what are you going to do with your major?" It's an innocent question that can haunt students from high school to graduate school and beyond. Relax. Your major is just the starting point for designing a meaningful future. 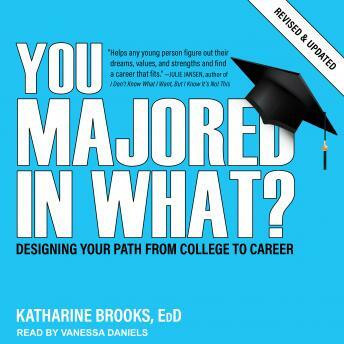 In this indispensable guide, Dr. Katharine Brooks shows you a creative, fun, and intelligent way to figure out what you want to do and how to get it-no matter what you studied in college. You will learn to map your experiences for insights into your strengths and passions, design possible lives, and create goals destined to take you wherever you want to go. Using techniques and ideas that have guided thousands of college students to successful careers, Dr. Brooks will teach you to outsmart and outperform your competition, with more Wisdom Builders and an easily applied career development process. No matter what career you aspire to, You Majored in What? offers a practical, creative, and successful approach to finding your path to career fulfillment.